Several years ago, I became bullish on an idea that the rest of the market had left for dead. The companies in this sector weren't the kind you'd bring up at a cocktail party. And they certainly weren't the market darlings you hear about every day on CNBC or on the cover of Fortune. You may have to look closely for these opportunities, but it's well worth your time. Once the market realizes its mistake, the gains can pile up fast. The worst sort of business is one that grows rapidly, requires significant capital to engender the growth, and then earns little or no money. Think airlines. Here a durable competitive advantage has proven elusive ever since the days of the Wright Brothers. But then the industry slowly got better. What changed? Simple: The industry consolidated. Over the past decade alone, we've seen mergers between Northwest and Delta, Continental and United, Air Tran and Southwest, and U.S. Airways and American Airlines. These four companies collectively control about 80% of the U.S. airline market, making it an oligopoly. And they're behaving like an oligopoly, minimizing the incessant price wars that once plagued the industry. Plus, the airlines crammed more seats on their planes and started charging to check bags. The combination of higher prices and lots of ancillary fees generated billions in new profits. This allowed the airlines – which historically had terrible, debt-laden balance sheets – to slowly pay down their debts and improve their financial footing. The fundamentals got a big boost while nobody was paying attention. 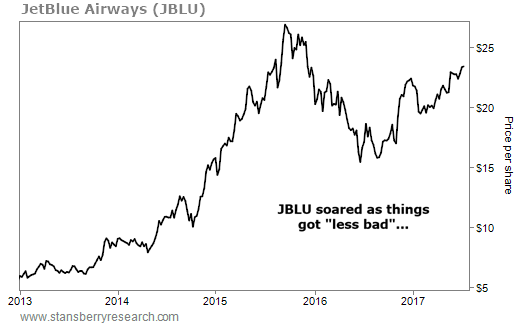 My first opportunity to profit from this was JetBlue Airways (JBLU). I had gotten to know the company when I wrote a series of five articles about it starting in June 2003. I hadn't bought the stock, but I followed it closely over the next decade. I finally got my chance and bought shares in 2014, when the company made big improvements. It followed its peers by charging bag fees, squeezing more seats on the planes, and launching a first-class cabin on transcontinental flights. Not only that, but a new CEO was taking over, and my contact at JetBlue told me he was the real deal. Years later, in November 2015, I told Bloomberg TV's Stephanie Ruhle that discount airline Spirit Airlines (SAVE) was my favorite long idea. The stock nearly doubled over the next year. The airlines had a bad 20th century. They're like the Chicago Cubs. And they got that bad century out of the way, I hope. Things didn't go from good to great with airlines. They didn't have to. They merely went from terrible to mediocre. And folks who took my advice made a lot of money because of it – and fast. The next time a hated stock or industry catches your eye, tune out all the negative headlines and analyst "sell" recommendations, keep an open mind, and take a fresh look. 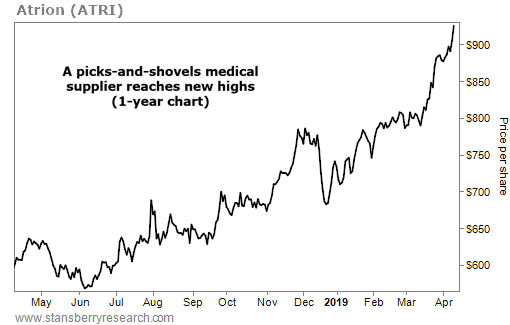 Maybe the fundamentals are quietly getting stronger, or sector-wide pressures are letting up. All it takes is a little improvement... And chances are, you'll walk away with quick, big gains. Editor's note: If you'd like to learn more about how Whitney searches the markets for big potential winners, mark your calendar... On Wednesday, April 17 at 8 p.m. Eastern, he's airing a special event to announce his newest prediction – one that could help you double or triple your money, starting this year. For more details (including how to tune in for free), click here. "I've learned a lot of things over my 20-year career on Wall Street," Whitney writes. "But perhaps nothing is as valuable as talking about investing with average folks." Get the details on what he calls the "cocktail-party indicator" – and how you can use it to your advantage – right here. "Folks are almost unanimously nervous about the recent rally in the markets," Steve says. "But that fear you feel is exactly why stocks still have plenty of upside ahead." Learn more about a recent sentiment extreme that proves it right here: Another Reason to Bet on the Melt Up Today. We’re talking about Atrion (ATRI). This company makes medical devices for niche health care markets. Its products include valves for syringes, medical-tubing clamps, and even devices that deliver fluids to patients during open-heart surgery. Most people don’t think “fluid-delivery products” when they think of open-heart surgery… But they are a necessary tool. And providing tools to the health care sector helps Atrion make consistent sales… Last year, the company reported revenues of $152 million, up 4% from 2017.